The Academy of Yachting was officially founded in 2017 to educate and provide resources for club and squadron officers and members. Get a glimpse of the history of the Academy here. Why Should My Club Join? The first of a series of videos presenting issues of interest to club members, officers and managers, this 9 minute video clarifies what is discrimination under the law and how your club can avoid clostly lawsuits. Receive this informative boxed set ABSOLUTELY FREE! 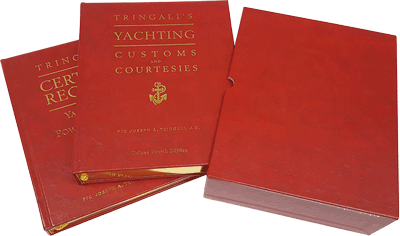 When your club or squadron joins the Academy of Yachting your organization will receive, absolutely free, the Deluxe Fourth Edition of Yachting Customs and Courtesies – which is now a boxed set of two beautifully bound full-color volumes – “Tringali’s Yachting Customs and Courtesies” and “Tringali’s Certified Registry of Yacht Clubs and Power Squadrons”. Individual members of member clubs and/or squadrons receive a 20% discount on any Calkins Harbor Publishing (including Yachting Customs and Courtesies Deluxe Edition) book purchases with their club coupon code. Your club or squadron isn’t ready to join the Academy? You can still buy the book set at the full price by clicking the button. By submitting this form, you are granting: The Academy of Yachting and Calkins Harbor Publishing, PO Box 14838, North Palm Beach, FL, 33408, permission to email you. You may unsubscribe via the link found at the bottom of every email. Emails are serviced by Constant Contact.